The education sector is very heavily regulated, with guidelines on what needs to be taught and what types of evidence the students need to provide to show they have the required knowledge and skills. Accredited training and non-accredited training. Accredited Training means that the course is nationally recognised and that a registered training organisation (RTO) can issue a nationally recognised qualification, or Statement of Attainment, once the course is fully or partially completed. is aligned to the appropriate level of the Australian Qualifications Framework where it leads to a qualification. Non-Accredited Training refers to structured, taught learning, but is different from formal assessment because it doesn’t lead to a qualification within the AQF. It includes non-accredited training that has been designed to meet an individual’s specific need or interest area, rather than being structured to meet guidelines that are set by national regulators. At The Academy, we utilise both forms of education to get the right mix of skills and development opportunities for all our students who are engaged in our program. When we make the important decision to select units for our accredited program, we use an extensive consultation process that involves all Academy staff and advice from external industry professionals. For example, how many times have you joked about not using the Pythagorean theorem or long division outside of the classroom? It’s funny because it’s true. When you learn maths at the Academy, it’s actually integrated into our Show Me The Money program. Students complete five modules (saving, budgeting and spending, Personal Tax, Superannuation, Debt Management, and Insurance). Not only do you benefit from using ‘real life maths skills’, such as calculating interest rates on home loans, credit cards, comparing insurance policies and understanding how superannuation works, you are also gaining valuable skills that you will implement in your own life – practical skills that really will make a difference to your adult life. At the Academy, we focus on teaching transferable skills. 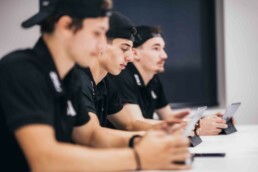 Even in the accredited units, we ensure our students get the opportunity to participate in individual assessments, but also group work, ensuring that all our students are exposed to working in teams, and the challenge of dealing with time-management pressures, conflict resolution, problem-solving and communication skills. One of the most exciting non-accredited education experiences at The Academy is the personality testing. Students undergo a personality test and are provided with a comprehensive report on their personality traits. We then complete a 10-week program that allows you to analyse your strengths and weaknesses, and how they work best, plus what other personality types you work best with. I think the best part of this program is that it gives all students the opportunity to learn how they can work best with people that their personality would usually clash with. How many times in life have you already had to work with someone that you didn’t quite connect with? For all of our students at The Academy, the skills to recognise traits in yourself and adjust your communication skills to gain the best results possible in any situation – whether that’s on the football field or in a workplace – will make a positive difference to your life. The Academy team is committed to continually improving our education program through industry consultation and continuous improvement practices implemented quarterly. We aim to create resilient, life-ready people who leave The Academy with a strong direction in what career or further education path they wish to take. Imagine the possibilities you can enjoy in your personal and professional future if we create the opportunity to truly engage you in your passion, learn about yourself and your individual learning styles and provide you with engaging, relevant, current education experiences to improve your skills and knowledge – for life! We aim to create resilient, life-ready people who leave The Academy with a strong direction in what career or further education path they wish to take.